Warren Agin, senior consultant and director of professional development at LexPredict, LLC, is certain that machines won’t replace humans in all tasks. But, they will transform how lawyers provide professional services in the future. 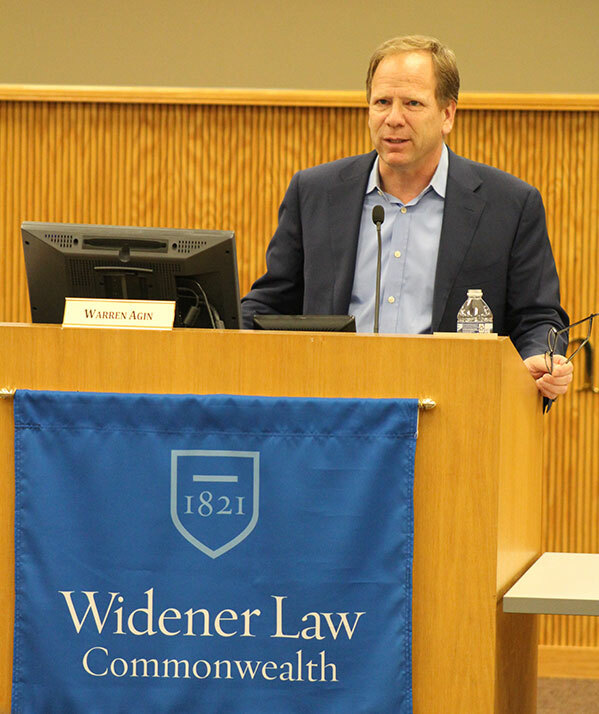 Agin, founder and chair of the American Bar Association Business Law Section Legal Analytics Committee, presented the Business Advising Program’s annual Fall Lecture, Artificial Intelligence and Modern Legal Practice: A Vision of the Law in the 21st Century at Widener Law Commonwealth. In his lecture, he discussed what artificial intelligence is and gave a history of how machine learning has changed since the 1940s, when it began. He explained that machine learning, or artificial intelligence, is math techniques and algorithms put together and then programmed into a machine that is able to complete a task. Machine learning has been around about 80 years, but when it was introduced to the public it didn’t have a large impact on how lawyers practiced because of the prohibitive cost and time it took to build the machines. As technology developed, machines became smaller, cheaper, more efficient, and easily accessible, and they gradually changed the way the legal process was conducted, such as sorting large amounts of data and making legal research faster. He added that lawyers’ jobs continue to change because of the advancements of artificial intelligence. The lecture was presented by Widener Law Commonwealth Business Advising Program and sponsored by Members 1st Federal Credit Union and Eckert Seamans Attorneys at Law.